Nebraska football fans are just now settling in for a long summer’s absence of football. And with the arrival of new head coach Mike Riley, Nebraska fans have had a lot of change to absorb. But before we let spring football for 2015 go, let’s take time to look back and see what we’ve learned about the new-look Nebraska. After the Bill Callahan experience, Nebraska fans can be forgiven for their concern about a coaching change. Nebraska’s 2004 campaign was a disaster, with Callahan attempting to force the square peg of quarterback Joe Dailey into the round hold of Callahan’s West Coast offense. The result was a 5-6 season and a poisoning of the well between Callahan and the fan base. Riley looks to understand the folly of that arrogance. According to Tom Shatel of the Omaha World-Herald, Riley and offensive coordinator Danny Langsdorf look to be tailoring Nebraska’s 2015 offense to the strengths of its talents, rather than trying to force them into a rigid system. For example, Nebraska looks to be operating more out of a shotgun this year, even though it appears that Riley and Langsdorf would prefer a quarterback operating under center. Bo Pelini’s defensive scheme was very effective, no one will deny that. But it was also very complicated, and relied on players (particularly safeties) to make reads and respond accordingly. A mistake on those reads could be catastrophic. New defensive coordinator Mark Banker’s system looks to be simpler, relying more on the athleticism of its players to be effective. Linebacker Josh Banderas compared Banker’s system to Pelini’s (according to Lee Barfknecht of the Omaha World-Herald) and his thoughts were revealing. Now, simpler and more fluid can be a two-edged sword. Nebraska may be vulnerable to being out-schemed offensively, or just out-matched athletically. But at the very least, the Blackshirts will look very different under the new regime. Armstrong has a career completion percentage of 52.9 percent. At the Spring Game, his completion percentage was 50 percent. While Riley has a history of working with and improving quarterbacks, and Langsdorf arrives in Lincoln after coaching quarterbacks for the New York Giants, the idea of Armstrong dramatically improving his accuracy is still worthy of skepticism. As a certain smart and particularly handsome analyst observed, that’s just not good enough for Nebraska to win a conference title. And yet, everyone from Tom Shatel of the Omaha World-Herald to Mitch Sherman of ESPN to Steven M. Sipple of the Lincoln Journal-Star remain convinced that the starting quarterback’s job is Armstrong’s to lose. Certainly, Armstrong’s experience and success as a starter are huge advantages for him. Perhaps Armstrong can make strides in Riley’s offense. Or perhaps the other quarterbacks on the roster simply haven’t been capable of showing enough in practice to unseat the incumbent. So absent a huge shakeup in fall camp, look for Armstrong to lead the line for Nebraska against BYU in September. Nebraska fans can be forgiven for having nightmares about the jet sweep, after Wisconsin ground the Blackshirts to a fine red mist deploying it with Melvin Gordon in the 2012 Big Ten Championship game. Well, it looks like Nebraska will finally be joining that party. 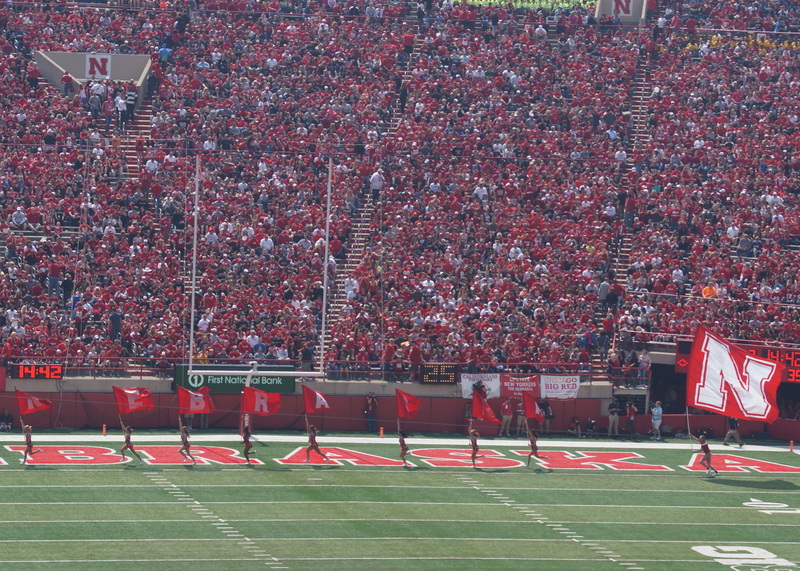 At the Spring Game, we saw the jet sweep deployed a number of times, to great effect. Combining a jet sweep or a fake sweep with an inside zone running game gives Nebraska an opportunity to put defenders in a quandary, forcing them to make a decision and perhaps be a step or two behind the ball carrier. According to Sam McKewon and Jon Nyatawa of the Omaha World-Herald, don’t be surprised to see the jet sweep as a staple of Nebraska’s offensive attack. If nothing else, Pelini’s departure has freed some of the journalists covering Nebraska to lift the curtain and show off some of the warts that were present under his leadership. Steven M. Sipple of the Lincoln Journal-Star discussed the “mismanagement” of linebacker Josh Banderas, to the point of him nearing a transfer. Perhaps more damning, Lee Barfknecht of the Omaha World-Herald wrote about Pelini’s “loser’s limp” of complaining how hard it was to recruit to Lincoln, and about the “frat house” atmosphere in the football program without “adult” leadership. Is that a little thing? Of course it is. But big things are nothing more than a collection of little things put in the proper order. Riley’s arrival does not, of course, guarantee success for Nebraska. Indeed, in 2015 Riley will face a challenge to even equal Pelini’s win-loss total from the previous season. But there is no question that Nebraska under Riley will look and feel radically different than it did under Pelini. “Big things are nothing more than a collection of little things put in the proper order.” I love that statement. I’m going to steal it and claim I came up with it all on my own. Cool? Cool. Excellent article. I think the last point that you make is both the most interesting and the best reason for hope, while also being a reason for concern. Everyone is so positive about Riley and the direction of the program right now, which is great and definitely a welcome change from the previous years. I just hope we don’t start to expect too much too quickly. Much as I like Riley and think Pelini made mountains out of molehills with his aforementioned “loser’s limp,” Nebraska is still a small school, in a relatively small city, in a cold-weather state that most recruits don’t know the first thing about. I love Lincoln, there’s a lot to love about living there and a lot o exciting things happening there. But does the average high school super athlete know about that? My guess is no. And while Riley as his staff can certainly do a lot to change that, they have a lot more work cut out for them than, say, Urban Meyer or Jim Harbaugh. Is Lincoln as painful a place to recruit to as Pelini made it out to be? No, of course not. But is it still a place where a coach can field the kind of recruiting classes you need to win conference championships and compete for national titles? I guess we’ll find out. I just hope if we find that the answer is also “no,” all of this optimism and positivity doesn’t turn into disillusion and jadedness, as has happened so often. Great points, and it ultimately boils down to the ultimate question for fans — what should you expect from your team? Expect too little, and the team is never pushed to achieve (see, e.g., the Chicago Cubs and the Iowa Hawkeyes). But expect too much and you create an untenable pressure-cooker of a situation. The thing is, I don’t know if we will ever “find out” that Nebraska is a place to which top flight talent cannot be recruited. It has in the not-too-distant past, and there are too many places (Wisconsin, Michigan State, Oregon, and Oklahoma State, to name a few) with similar geographic challenges to prove it can be done. I think the question of CAN Nebraska be successful is settled in the affirmative — and if it ever isn’t with the fan base, then we run the risk of suffering from what Iowa has now. The bigger question is whether Riley is the right guy to achieve that standard that Eichorst set in his press conference (which, in all candor, might be one of the most important public statements in the recent history of Nebraska football) and how long he gets to get there. Thanks so much for your reads and your thoughtful responses!